Catherine Porter, the Canada bureau chief for the New York Times, shared her experiences covering the aftermath of the 2010 earthquake in Haiti at a Ryerson Review of Journalism event. Photo courtesy of Amanda Pope/RJRC. 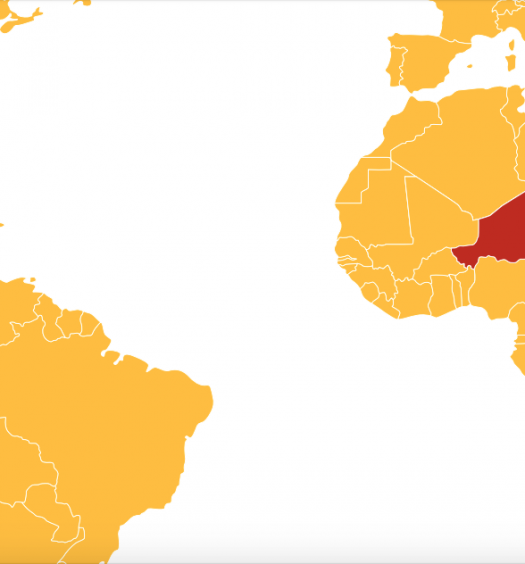 Reporters who fly in to cover natural disasters must report on people suffering the consequences with respect and compassion, says journalist Catherine Porter, who arrived in Haiti soon after the 2010 earthquake to cover the story for the Toronto Star. 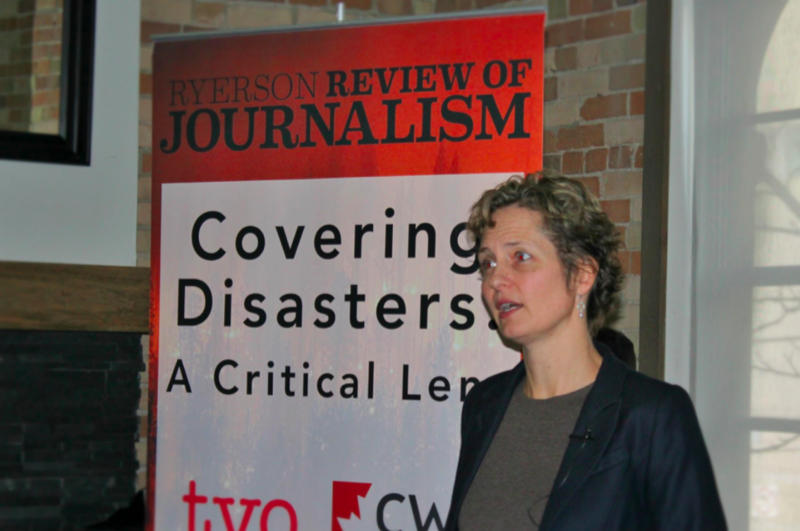 Porter was one of several speakers at a recent Ryerson Review of Journalismconference to emphasize that journalists must retain their sense of humanity toward victims of devastating wildfires, earthquakes, hurricanes, mudslides and other disasters. 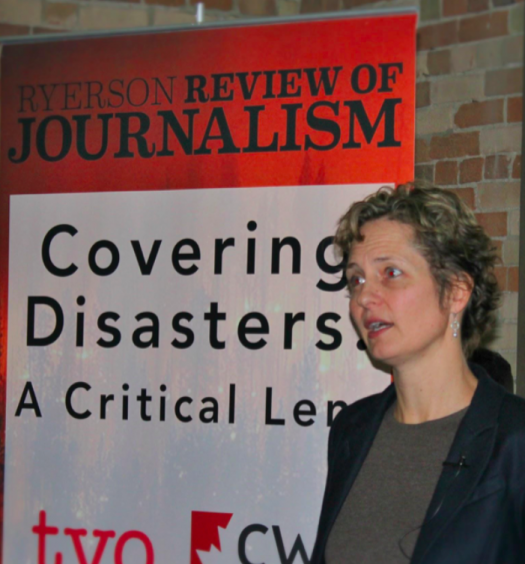 Covering Disasters: A Critical Lens, a day-long event held at Ryerson University’s School of Journalism, explored how journalists can prepare to cover disasters and where they are missing the mark. Porter, the keynote speaker at the Nov. 21 conference, recalled the experience of touring a public hospital in Haiti to illustrate how vulnerable people can be treated without dignity. The Spanish doctor who took her on the tour “walked me into a room where I found a completely naked woman on a bare metal table giving birth and she was crowning,” Porter said. “As someone who has given birth twice naturally and has been in that position of complete vulnerability, I was shocked. “I looked back on that and thought … ‘Why did that Spanish doctor think it was okay to bring me into that room so casually when I was not writing about women giving birth there?’ That would never ever happen in Canada,” she said. Ed Ou, a visual journalist with NBC News based in New York, also discussed the need to focus on the person beyond the tragedy. Ou travelled to Kazakhstan in 2008 to photograph the lasting effects of radiation on the two million civilians who were exposed when the Soviet government test fired more than 400 nuclear weapons during the Cold War. He said he spent as much time as he could with survivors to get a sense of who they are as people. Continue reading this story on the Ryerson Journalism Research Centre website, where it was first published.